In the study of taxonomy, the rank of kingdom is just below domain, as seen on the image below. All of life, thought to come from a single origin, can be broken down into lower levels of classification, such as a kingdom or phylum. Each consecutive level represents a more related group of organisms. This structure has evolved from only a few kingdom taxon with 3 or 4 lower divisions, to kingdom being the second highest division and having 6 divisions within that structure. This is to accommodate the growing number of recognized species and our understanding of how they are related. The four commonly recognized Kingdoms are Protista, Animalia, Plantae, and Fungi. The bacteria and archaea are sometimes grouped into one kingdom, the Monera, and sometimes given their own separate kingdom. Under the view that they belong to separate domains, they should be given separate kingdoms to reflect the structure of the taxonomical heirarchy. However, some scientists have argued against the taxonomical heirarchy, saying it does not accurately reflect the relationships between organisms. Carl Linnaeus first used the term in the 1700’s to describe the highest orders of life. The two main groups of life, as he saw it, were the kingdom Plantae and the kingdom Animalia. Modern microbiology and genetics have revealed a much different picture. By the 1990’s it was generally accepted that all of life should first be broken into three domains. 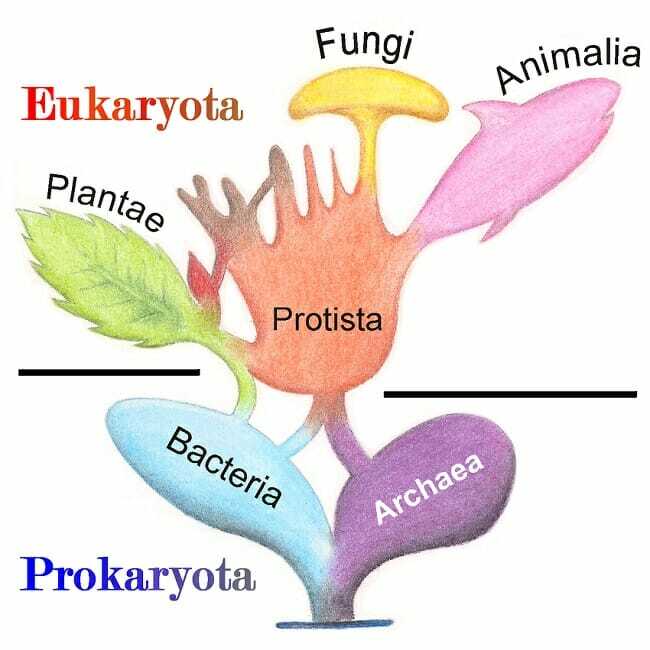 These domains, Bacteria, Archaea and Eukaryota, represent basic differences in cell structure, formation, and survival. As seen below, each major kingdom can fit within the domains, all of which are thought to have a common ancestor. Some of the taxon represented here are actually phylum, and don’t represent an entire kingdom. Advances in cladistics and genetics revealed some individual phylum to be closer to a kingdom. As discussed below, this lead to changes in the way we describe and view a kingdom. Over time, many different versions have evolved from Linnaeus’ first taxonomy. Scientists in the 1800s finally recognized protists and other single celled organisms in their own kingdom, and separated the fungi kingdom from the plant kingdom. More recently, genetic evidence has revealed the bacteria and protists to contain a huge variety of genetics and adaptations. This spurred the 3 domain system, which is typically accepted today. However, studies are continually being done on the legitimacy of the kingdoms and their organization. Some of this stems from new developments and studies which add to the picture. This constant addition of information is continually reforming taxonomy, and as such the definition and scope of ‘kingdom’ is constantly changing. Ideally, each kingdom would be a monophyletic group, consisting of a common ancestor and all the descendants, both extant and extinct. First off, it is impossible to know if all the extinct organisms have been found, and in all likeliness, they have not been. This creates large areas of doubt when constructing phylogenies, or trees of life. Consider the diagram below, which probably presents a fairly accurate representation of life as we know it. You will see that the various branches are well defined, but that all branches have roots in each other. Defining a kingdom, with this in mind, becomes very difficult. Without direct knowledge of the common ancestors, where do you draw the line between Protista and Fungi, for example? Further, since kingdom is more-or-less an arbitrary description, where does one draw the line between a domain and a kingdom? 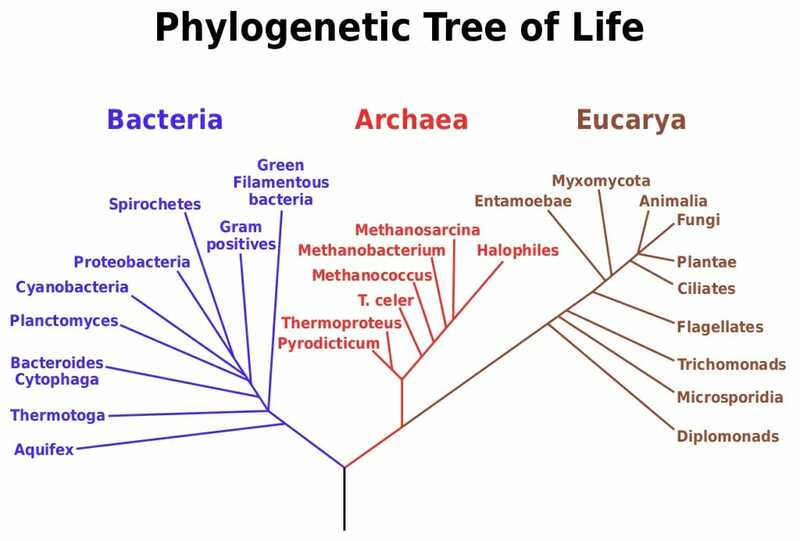 Bacteria and Archaea are both considered domains, while the rest of the branches belong to the Eukarya. It is up to taxonomists and phylogeny experts to try to understand the fundamental and at times hidden relationships between these kingdoms and domains. Many scientists have argued that the terms themselves have become arbitrary and burdensome. With the technological revolution, computers have been able to make more and more accurate phylogenies. Some argue that we should essentially scrap the old system and create a new definition of kingdom and other taxonomic terms which represent only monophyletic groupings as we currently accept them. 1. What is the difference between a kingdom and a phylum? B is correct. A kingdom is simply a description of relatedness between species which describes how related they are to other kingdoms. For example, there could be a kingdom of protists which is so different from other protists that it deserves its own unique kingdom designation. However, there could be only a single species in that kingdom. 2. Why do some scientists argue against the classic heirarchy structure of taxonomy? C is correct. Carl Linnaeus, while he was a visionary at the time, had no knowledge of genetics, microbiology, or developmental biology. Using these sciences, we have come to understand a much different picture of the organization of life. While it used to be very centered on vertebrates, we now understand that they are a small fraction of life on Earth. 3. While walking through your backyard, you discover a small mouse. Which kingdom does the mouse belong to? B is correct. The kingdom Animalia is easy to recognize, as it basically contains all non-photosynthesizing multicellular life. While the kingdom does have everything from worms to bears, like plants the boundaries are fairly clear. Within the bacteria and protists, however, there is almost no clear lines between organisms. Mus is the genus, while Mammalia is the class of the mouse. Brusca, R. C., & Brusca, G. J. (2003). Invertebrates. Sunderland, MA: Sinauer Associates, Inc.
McMahon, M. J., Kofranek, A. M., & Rubatzky, V. E. (2011). Plant Science: Growth, Development, and Utilization of Cultivated Plants (5th ed.). Boston: Prentince Hall. Pough, F. H., Janis, C. M., & Heiser, J. B. (2009). Vertebrate Life. Boston: Pearson Benjamin Cummings.